Consuelo Hernandez, Channing Wilson, Hannah Cifuentes and instructor Jeffrey Bernard were part of the group that started 100 Citizens at Stan State. 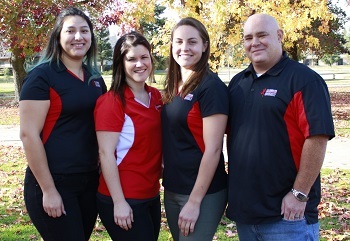 For California State University, Stanislaus senior kinesiology student Hannah Cifuentes, answering the call to help establish a public fitness group was a chance to add a nice line to her resume. It didn’t take long for the program, 100 Citizens, to become her cause. The program, started five years ago at Cal State Northridge, enlists kinesiology students to join with local parks and recreation departments to teach and offer fitness training free of charge to the general public. The first 100 Citizens partnership between Stan State and Turlock Parks and Recreation already has been added to the city’s official recreation calendar. The program, open to persons 18 and older, will start offering 50-minute workout sessions at 4 and 6 p.m. every Monday, Wednesday and Friday from Feb. 15-March 25 near the northeast parking lot at Donnelly Park. It’s a no-brainer, a win-win for everybody. The public gets a chance to improve their fitness, it’s a free program, and the students learn organizational and teaching skills that will be beneficial no matter what careers they pursue after college. Kinesiology professor Steven Loy at Cal State Northridge began the program in 2011, partnering with the city of San Fernando. Since then, the Northridge program has expanded to parks in Sylmar, La Crescenta and Canoga Park, with Loy reaching out to other CSU campuses in an effort to spread the program. Stan State kinesiology professor Jeffrey Bernard, who earned his master’s degree under Loy at Northridge, was an easy sell. A group of four Stanislaus students — Cifuentes, Channing Wilson of Turlock, Consuelo Hernandez of Livingston and Alexa Sanchez-Estrada of Merced — attended a 100 Citizens workshop at Northridge last February that included participating in one of the community workouts. The foursome came back to Turlock fired-up to get 100 Citizens up and running right away. But before they could schedule and conduct workouts, they had to form a partnership with the city. At this point, the students don’t know quite what to expect when they show up for the first class on Feb. 15. If the program gains a local foothold, Barnard vows to be ready with a never-ending stream of kinesiology students willing to help out. He’s enlisted the help of the students already in 100 Citizens to do the recruiting. As the students participate, they’ll be gaining practical, hand-on experience in their field of study. From that standpoint, it might be difficult to determine which group benefits more — the students or the people whose lives will improve through fitness. To register for 100 Citizens classes, visit the Turlock Parks and Recreation website .